Prestone | Why Do I Need to Check My Car’s Coolant? Just as oil is an essential fluid for your car and you know it’s important to check the level and keep it topped up, coolant is also crucial to the health of your engine. Without coolant/antifreeze your engine will suffer extreme damage, even when the temperature outside is moderate. While oil provides vital lubrication to moving parts to prevent wear, it can only do this if the engine is maintained at its optimum operating temperature. Engine coolant helps to cool the engine and without it the engine will overheat, leading to severe damage. You should check your coolant levels regularly, and if the level drops you should immediately top it up. Low levels of coolant/antifreeze could indicate a leak, so you either need to visit a mechanic or use a sealant product like Prestone Head Gasket and Engine Block Repair. How do I top up my coolant/antifreeze? When should I replace my coolant/antifreeze? Coolant should be replaced every couple of years, check your vehicle handbook for the coolant service interval. 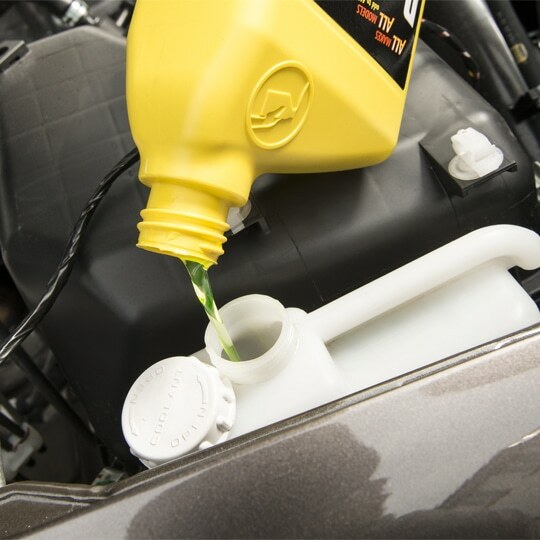 If you’ve used Prestone coolant/antifreeze your engine will be protected for 10 years or 150,000 miles. If you notice that your coolant/antifreeze has deposits in it or has turned a milky or chocolate colour, it will need to be replaced. This is also a strong indication that there is a problem somewhere inside the cooling system, so you should look for leaks and consult a mechanic quickly. To replace your coolant, you’ll first need to drain it. Make sure you wear gloves whenever you’re using coolant, and try not to get it on other surfaces like your car paintwork. Place a bucket under the radiator and open the drain valve. Alternatively, remove the bottom hose to the radiator if this is more accessible. Put the used coolant in a sealed container and dispose of it safely, not down sewers or storm drains. Close the drain valve or replace the bottom hose and fill the radiator with water to completely flush the system. Run the engine for a few minutes so it heats to a normal driving temperature. Once it’s cooled, drain the water as you did the coolant. Close the drain and make sure any hoses are refitted. Add the new coolant. For a full replacement of coolant, you might consider concentrated Prestone coolant/antifreeze; just add water to the required amount.